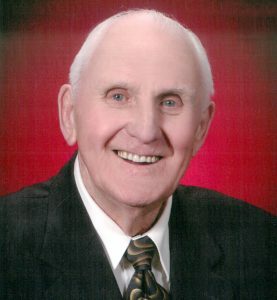 John A. Arends, 89, of Rockford, passed away Monday, April 8, 2019 at the Good Shepherd Health Center in Mason City with his family by his side. A Mass of Christian Burial will be held 10:30 a.m. on Friday, April 12, 2019 at Holy Name Catholic Church in Rockford with Monsignor John Hemann and Deacon Matthew Miller officiating. Burial will be at Riverside Cemetery in Rockford. Visitation will be at Holy Name Catholic Church in Rockford from 4-7 p.m. Thursday, April 11, 2019 with a Rosary being prayed at 3:30 p.m. Visitation will continue one hour prior to the Mass on Friday at the church. John Alvin Arends, the son of Jans and Ette (DeRaad) Arends, was born July 13, 1929 in Aplington, Iowa. He was raised in the Marble Rock area and attended school. John helped his father and his uncle with farming before starting to work on the railroad with his father at a young age. John began work at Oliver in Charles City in 1947 until he was drafted into the United States Army in 1951. He proudly served his country overseas in Korea during the Korean War for 11 months before his honorable discharge. John returned home to work at Oliver again for a short time. On October 31, 1953, John was united in marriage to Marlys Zeran in Rockford. John started his 23 year career at Rockford Brick and Tile in May of the same year (something that was supposed to last only three weeks). In 1977, John briefly worked at Allied before working for 17 years at Salsbury/Solvay in Charles City. He retired from there is 1994 and had to keep busy so helped at the Co-op in Rockford and worked part-time as both an Amway and Watkins salesperson (receiving the 2nd Best Salesman in Iowa award for his work with Watkins). John continued working these three jobs until caring for Marlys became his devotion. She passed away on August 25, 1999. John was a member of Holy Name Catholic Church where he served on the Board and completed scheduling (he converted to Catholicism for his family and without their knowledge), the VA, the American Legion, Senior Center in Mason City, a bowling league and received a certificate for donating six gallons of blood. He enjoyed gardening (mainly vegetables but flowers too), lawn work, playing board games and cards, dancing, fishing, trapping and watching sports (whether it be his grandchildren, Minnesota Twins, Minnesota Vikings or Iowa Hawkeyes). John loved his family very much and spending time with all of them. He even hosted the entire family for Christmas in 2018, which was quite an event. John’s greatest achievement for the love of his family was overcoming alcoholism in 1985. The relationships he had with his family were forever changed for the best because of this life-changing decision John made. He was a very compassionate person and never had a bad thing to say about anyone. Living family members include his six children: Kathy (Terry) Young of Manly, Joan (Brian) Hendrikson of Clear Lake, Jean (Jim) Ackermann of Blaine, Minnesota, Karen (Jerry) Schlader of Rockford, John Arends of Rockford and Keith (Monica) Arends of Rockford; 20 grandchildren; 20 great-grandchildren; 3 great-great grandchildren; two sisters: Edna King and Mary Jane Pickett; three brothers: Elmer (Liz) Arends, Gary Arends and Roger Arends; special friend, Darlene Schneider; along with numerous nieces, nephews, other family members and friends. John was preceded in death by his parents; wife, Marlys; daughter, Diane Jamtgaard; grandchildren: Sidney Riekens, Jr. and Jordan Arends; toddler brother, Siebe Arends; and siblings: Esther Green, Donald Arends and Liz Tegtmeier. In lieu of flowers the family suggests memorials to Holy Name Catholic Church and/or Hospice of North Iowa.